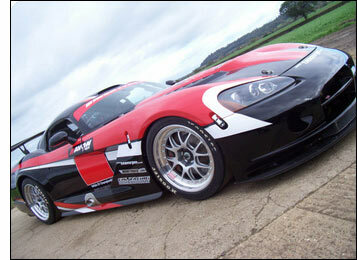 We described RPM’s Viper news – two GT3 cars for the British GT Championship in 2007 – as “the single most positive news item concerning British GTs for many years”. “I can’t believe the interest we’ve had in the cars,” said Robin Mortimer (team owner) at Brands Hatch a couple of days ago (RPM was running a Britsports car there). Robin’s son Alex Mortimer is pencilled in as one of the Viper drivers, as is 2006 partner Bradley Ellis, but the team is talking to a number of others, some of whom will be testing the team’s first chassis at Donington Park on Thursday of this week. Having the team’s truck at Brands Hatch on Saturday was quite handy, because it left the Kent circuit heading for Dover, and the long trek down to Oreca at Toulouse – to pick up the team’s second GT3 Viper. It should be back in the midlands on Thursday, although the team will be concentrating on testing the first chassis – and a number of drivers.